As a labor economist, Teresa Ghilarducci has spent her career working to ensure retirement security for all American workers. She joined The New School for Social Research as a professor of economics in 2008 after teaching at Notre Dame for 25 years. At The New School, she also directs the Schwartz Center for Economic Policy Analysis (SCEPA), which focuses on economic policy research and outreach. Ghilarducci frequently testifies before the U.S. Congress and serves as a media source to popular and online news outlets about pensions, labor economics, and older workers. Ghilarducci frequently publishes in economics journals and edited volumes and has authored several books. Her most recent, Rescuing Retirement, is co-authored by Hamilton “Tony” James, Executive Vice Chairman of The Blackstone Group. In an unusual partnership, they outline their bold policy vision to create Guaranteed Retirement Accounts (GRAs) for all American workers. Ghilarducci’s work focuses on the need to restore the promise of retirement for every American worker. To do so, she put forward a bold reform idea - the creation of Guaranteed Retirement Accounts (GRAs) – to solve the problems Americans now face in planning for retirement: decreasing coverage and contributions, increasing investment risk, portability, leakage, high fees, and the drawdown of benefits in retirement. The New York Times named Teresa Ghilarducci's pension reform proposal - Guaranteed Retirement Accounts (GRAs) - one of the defining ideas of 2008. Ghilarducci’s proposal has met with critical success from high-level opinion leaders. In February 2010, the White House Middle Class Task Force issued a report calling Ghilarducci’s proposal a viable option to help American families save for retirement, irrespective of their of financial sophistication, and called for further research on the plan. In July of 2009, the U.S. Government Accountability Office (GAO) identified GRAs as one alternative to overhaul the U.S. retirement system. In 2008, New York Times Magazine named the GRA Plan one of the best ideas of the year. “This plan is critical to warding off a looming retirement savings crisis,” said Michael Bloomberg, CEO of Bloomberg LP. In April 2014, Ghilarducci was appointed as a Commissioner for the Bipartisan Policy Center's Personal Savings Initiative. Additionally, Ghilarducci serves as a trustee for two retiree health care trusts: one for the United Auto Worker (UAW) retirees at GM, Ford, and Chrysler, and the other for Steelworker retirees at Goodyear. She was twice appointed by President Clinton to serve on the Pension Benefit Guaranty Corporation advisory board, serving from 1995- 2002. She has been a member of the General Accounting Office Retirement Policy Advisory Panel since 2002. On the state level, she served on Governor Schwarzenegger’s Public Employee Post-Employment Benefits Commission in 2007 and was appointed by the governor of Indiana to serve as a trustee on the state’s Public Employee Retirement Fund from 1997 to 2002. From 2010 to 2011, Ghilarducci was a member of the Board of Directors of YRC Worldwide Inc., a transportation and logistics service provider, as part of an agreement between the company and the International Brotherhood of Teamsters to help the company maintain their retirement benefits in an increasingly competitive market. 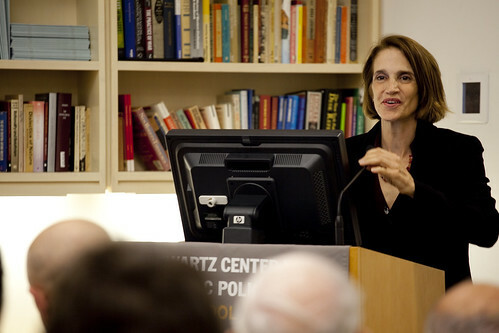 Ghilarducci received her PhD in economics from the University of California at Berkeley. From 2007 to 2009, she was the Wurf fellow at the Labor and Worklife Program at Harvard Law School. She currently serves as a member of the Board of Directors of the Economic Policy Institute, a non-partisan think tank in Washington, D.C., that works to include the interests of low- and middle-income workers in economic policy. 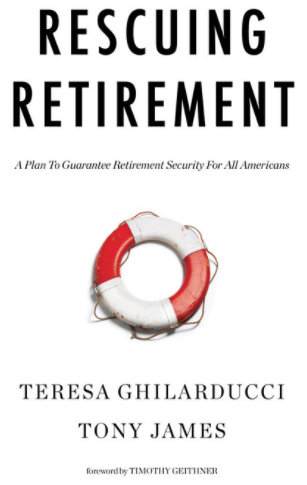 In addition to Rescuing Retirement, Ghilarducci has authored several books on retirement security, including How to Retire with Enough Money; When I’m Sixty Four: The Plot Against Pensions and the Plan to Save Them; Labor's Capital: The Economics and Politics of Employer Pensions, winner of an Association of American Publishers award in 1992; and Portable Pension Plans for Casual Labor Markets. She also writes a regular column for Forbes #RetireWell blog. Her next book, Let Us Now Praise Retirement: Second Thoughts about Older Working, will describe the reality of the lives of Americans working later in life. 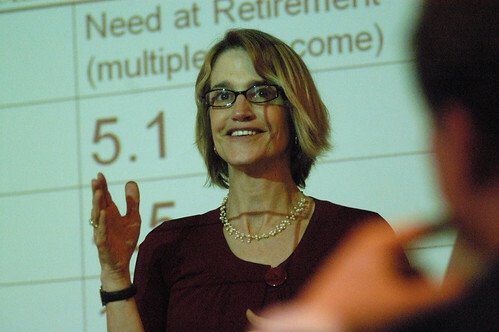 In addition to winning AARP’s Social Security Innovation Challenge, her research has been funded by the Alfred P. Sloan Foundation, Borchard Foundation Center on Law and Aging, Ford Foundation, the U.S. Department of Labor and National Endowment for Financial Education (NEFE), Retirement Research Foundation, and the W.E. Upjohn Institute for Employment Research.